Staying hydrated is crucial to powering your workouts and maintaining a healthy weight. Use this calculator to find out how many cups of water you should drink each day. When you don't drink enough water, your athletic potential is also reduced. Even slight dehydration can cause a major decrease in performance.2 If your body isn't getting the fluids it needs, you won't be able to push hard in the gym and get after those gains. If you sweat a lot because of exercise intensity or heat, you may want to consider taking supplemental electrolytes to replace the minerals you lose through perspiration. Electrolyte tablets that dissolve in water do the job well, plus they add flavor, so it's more appealing to drink up. The National Academy of Sciences recommends drinking about 11 cups of water per day for women and 16 cups per day for men.3 But, this number can vary based on lifestyle, body size, and other factors. If you're active, you'll need to increase your daily water intake. Variables such as living in a hot climate or wearing a heavy sweater can also increase your hydration needs. Keep in mind that you don't have to just drink plain water to stay hydrated. Fluids from other drinks, like protein shakes, BCAA drinks, coffee, and smoothies also count toward your water intake requirement. You also get water from foods, especially fruits, vegetables, and dishes like soup. Drinking extra water can boost calorie burn, helping you to lose weight. However, the effect is modest. 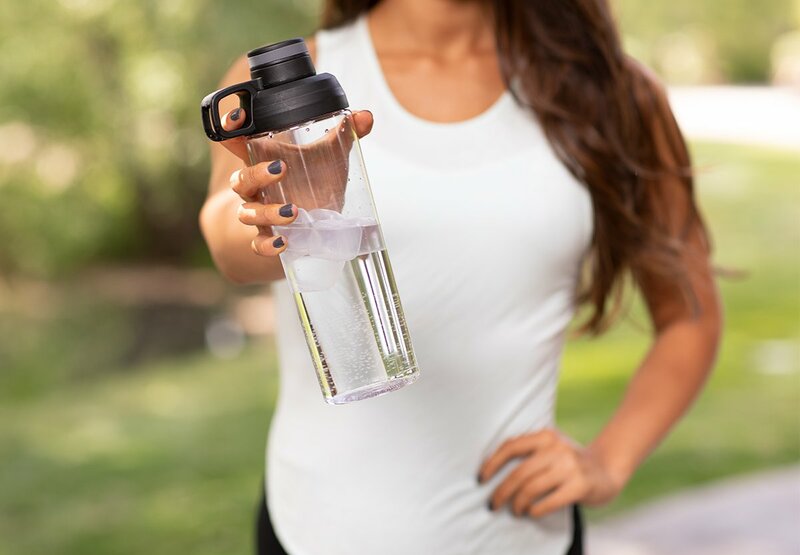 You'd have to drink eight extra cups of water per day to increase your calorie burn by 100 calories, with cold water giving the best boost.1 Keeping your kidneys happy so you don't retain excessive water weight is the most noticeable weight-loss benefit of staying hydrated. Since staying hydrated can help you work out longer and harder, you'll get more out of your gym sessions and maximize your calorie burn. But you need to drink water throughout the day, not just at the gym! Taking in adequate fluids throughout the day will ensure you're already hydrated when you begin your workout. This is especially important if you work out first thing in the morning, before you've had a chance to chug a bunch of water. Lose Water Weight By Drinking More Water? This sounds a little counterintuitive, but let me explain. Ever wondered why some people can be shredded in their arms and legs, but still have some "puppy fat" around the belly? Or why, no matter how on point your diet and workout plan is, there are just some stubborn areas of "thick skin" you can't seem to shed? Well, it may be that what you mistook for excess fat is actually water weight. This type of fatty-looking skin is called "subcutaneous fluid," and it's a sign that you are probably not drinking enough water. Yes, that's right: Subcutaneous fluid is primarily made up of excess fluids (and sodium), and the solution is to drink more fluids. Why? When you are giving your body enough fluids, it doesn't need to store fluids for later. Your body is a survival machine with thousands of tricks up its sleeve—some of which were evolved to help your ancestors survive in harsh climates. Drinking enough water will tell your kidneys that times are OK and that your body can flush those excess fluids hiding beneath the skin. While it's important to be getting enough fluids, it's also important to make sure that these are clean, healthy fluids. If you don't have easy access to clean, filtered water, maybe it's time to have a stock of water bottles on hand or consider getting a water cooler. What Does Water Do In The Body? You know this already, but water is essential for life. Not just human life—all life. So, what does it actually do? This doesn't have to mean that you fall to the floor mid bench press, or that you start to feel lightheaded and dizzy—in fact, many people may not notice anything at all. They can go a lifetime without realizing that they are undercutting themselves by not giving their body the fluids it needs. Two percent really isn't that much when it comes to fluid loss; just consider the fact that severe cases of dehydration can mean losing up to 10 percent of your overall body weight. When you exercise, your body begins to overheat due to burning molecular fuel and other nutrients. To maintain business as usual, the body needs to find ways of returning to that stable 98.6 degrees (37 Celsius). The best cooling system we have is sweating. You may not think of it this way, but sweating is actually an exchange of heat between your skin and the atmosphere. It's also a process that eats up a lot of fluids and electrolytes. Fun Fact: Sweat only works if it evaporates. When it is able to become a gas, it takes heat energy away from your body, leaving the remaining water molecules feeling cooler on your skin. In one hour of consistent exercise, your body can easily drop 3-5 pounds of fluids—these need to be replaced. Unfortunately, the body isn't able to absorb fluids as quickly as it can give them up. Under the most extreme conditions, the body can lose 100 fluid ounces in an hour of exercise. Meanwhile, at its best, it can only absorb 30. That leaves us with a large discrepancy, and this is why (no matter how hard you try to stay hydrated) some conditions simply aren't fit for long periods of exercise. That would include incredibly hot and humid environments, where sweat cannot evaporate due to the atmosphere already being saturated with water. For all of that, it's still good to have a rough guide. This is the one I follow: To stay properly hydrated, drink roughly 8 fluid ounces per 15 minutes of exercise. If our bodies are three times more effective at losing water than absorbing it, how do we stay hydrated? Fortunately, we are not losing fluids rapidly at all hours of the day. For the most part, we can steadily gain and maintain fluids throughout the day. But, this is why it's so important to get most of your fluids outside of the gym. The fluid recovery stage after exercise lasts 8-10 hours. That means as much as 10 hours after your workout, your body is searching for fluids to recover properly. You should make sure it finds them; if not, your workout may not get the gains you feel it deserves. Working hard in the gym is one thing, but taking care of your body's nutrition, health, and hydration is a lifestyle which lasts the whole day, every day. 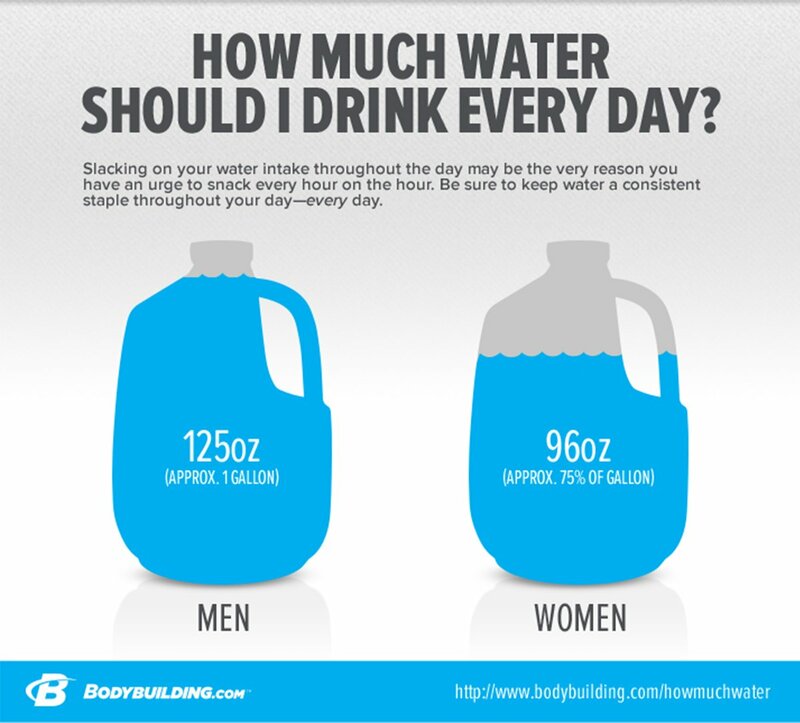 Recommended Daily Water Intake: Is It Accurate? The water intake calculator above will tell you how many ounces of water a day you should aim for, but are there any other factors to consider? Let's put it this way: When friends and family ask me, "How much water should I drink?" I'm comfortable recommending the water calculator. However, as with anything, there is some wiggle room. Factors like climate, exercise habits, and even altitude should also be taken into consideration when finding the best daily water intake. Climate is a big one to understand since people can often be misled by what seems like common sense. For example: "Hot weather means we should drink more water, so cold weather means we don't need to drink as much." This, unfortunately, is wrong. The truth is, in both climates (hot or cold) the body is in need of extra fluids for different reasons. When the weather is hot, our body naturally sweats more to cool us down; this increases fluid loss, thus requiring a higher water intake. However, cold weather can be equally brutal for fluid loss. In colder climates, there is typically less water in the air, which results in the body losing fluids at a faster rate than usual. Fluids are also more difficult to keep warm than solids—when the body is cold, it flushes fluids rather than spending the extra energy on warming them up. Humid conditions, too, mean that the body's natural cooling system (sweating) is not as effective since the fluid cannot readily evaporate. This leads to the body overheating, requiring more fluids to cool it down again. Activity is also a largely misunderstood (or, at least, underestimated) area of good hydration habits. Many people know enough to drink water while they exercise, however, they seem to think that the processes from mouth to muscle are instantaneous. Like Popeye eating his spinach, you might imagine water and electrolytes spreading through the body and muscles like wildfire. The truth is, if you only start drinking water at the beginning of your workout, it's already too late. (Although, at that stage, you should certainly still drink plenty for the remainder of the session!) Ideally, for the few hours leading into your workout, you should be drinking roughly a cup an hour. I find that two cups, or a 600-milliliter bottle, in the two hours before my workout is enough, especially if I've been staying hydrated throughout the day. Altitude may not be such a common factor, but it's worth knowing about if you're a frequent flyer. Perhaps you've already experienced a post-flight workout—jelly legs, fatigue, general muscle weakness, and soreness the next day. Long flights are known to throw off your circadian rhythms and negatively affect blood flow, but these simple workout symptoms are most likely the work of inadequate hydration. Low air pressure and heavy climatization on commercial flights encourage your body to shed fluids like nothing else (evaporating fluids more often than noticeably sweating it out), leaving you and your muscles parched and unprepared for activity. It has become widespread knowledge that drinking a lot of coffee can make you dehydrated. Since large doses of caffeine can act as a mild diuretic, many have concluded that coffee is a dangerous dehydrator. But what does the research say? Well, it's actually clear on this point: Caffeine consumption has no significant effect on hydration or fluid loss.9 Study after study after study have shown that, when you actually take a look at the data, caffeine simply is not linked to dehydration. These studies also show that, while acute caffeine intake can act as a mild diuretic (mostly in females), these effects are eliminated when people start to exercise. That's right: When you exercise, the diuretic role of caffeine is non-existent and fluid loss occurs at its normal rate. So where did the original idea come from? Strangely enough, this idea is almost a century old. In 1928, a study examined and reported the diuretic effect (something that will increase the frequency of urination) of caffeine.10 Ever since, it has made its way into the folklore of fitness nutrition, steering the physically active away from coffee, tea, and other caffeinated beverages. Even the British Olympic teams were advised to avoid their intake of coffee, tea, and cola drinks, on account of their influence on fluid loss. So, if there's no effect...what's the problem? In the end, maybe you're right and it isn't such a big deal. If you're a regular coffee drinker, worst case is that you've been overcompensating with your water intake. Considering everything we've spoken about in this article, that's probably not a bad thing! But, I like to be right for the right reasons. And when it comes to fitness enthusiasts and high-level athletes, these kinds of findings do matter. It's important to know what a substance will do to your body, and that an entire tradition of common knowledge has been mistaken. Caffeine is a known performance enhancer, and when athletes steer clear of it on account of its "dehydrating effect," they are selling themselves short. It's also useful for the big coffee drinkers to know that those morning coffees are counting toward their daily water intake, and not taking away from it. It may be a small victory, but that feels like a win to me, and every win counts. Other, more subtle deviations from your regular schedule can influence how much water you should drink daily. For example, illness and sleepless nights can also result in significant fluid loss. One way of correcting for this is by drinking more water than usual the following morning; however, I am a fan of attempting to meet the problem at its root. Poor sleep quality is, in my experience, more commonly suffered than it needs to be. In many cases, the simple addition of a magnesium glycinate or a similar compound can be the difference between tossing and turning every other night and sleeping like a baby for your remaining years. Now that you have taken my advice and raised your daily water intake, it's time to discuss electrolytes and multivitamins. When your body is working hard and replenishing those fluids as it should be, it might help to think of the system as a water wheel. You're constantly picking up and dropping fluids, so that while the machine is running smoothly, there are also some important things being filtered out. Endurance athletes and bodybuilders who are cutting water weight before an event know the importance of supplementing with multivitamins and electrolytes. There's a reason you see elite athletes drinking Gatorade, Powerade, and other colorful, sugary beverages which they wouldn't normally be touching: Proper hydration means that you will go through important minerals at a faster rate through urination. This is only a problem if you're not aware of it. The simple fix is to make sure that you consume one electrolyte drink on workout days, and supplement with multivitamins during the first weeks of a new routine. Once you've been meeting your daily water intake for a few weeks, your body will adapt to the new set-up and a healthy, varied diet will be enough without multivitamin supplements. 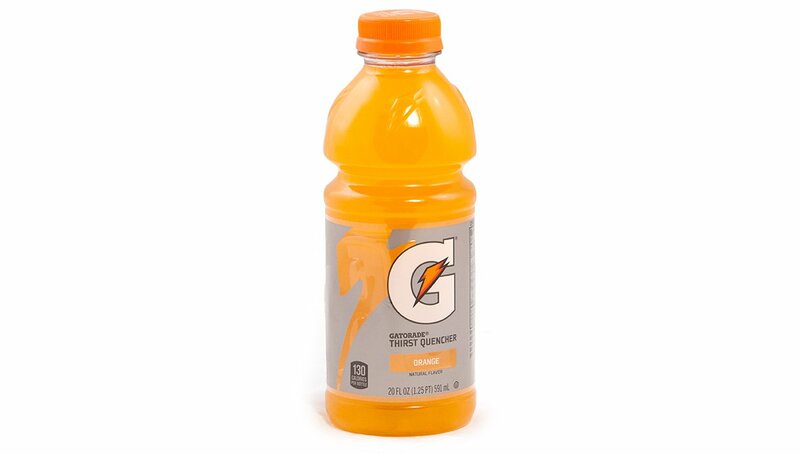 I recommend electrolytes on a weekly basis, particularly if you are exercising regularly. Drinking too much water can result in hyponatremia, a condition in which you don't have enough sodium in your blood. Hyponatremia can be serious and even fatal, but it's rare—you'd have to down gallons of water at a time.11 That's a lot, so don't worry about it. Focus instead on getting enough fluids, which is a much more common challenge. Staying hydrated is perhaps the most natural improvement you can make to your daily health. It's all about habit. I remember learning that in order to meet my daily water intake, I would need 148 fluid ounces (over a gallon) each day—it seemed an impossible task. I started taking my water bottle with me, keeping it in my backpack when I was out, or by my desk while at work. Before I knew it, I was refilling it several times a day without thinking, and now it feels strange not to have water with me wherever I go. Your brain only needs a couple of weeks to form a new habit, and keeping a water bottle close by could be a real game-changer for people trying to improve their daily hydration. When hydration becomes a part of your daily routine, you don't need to think about it. Keep in mind that the figures in this article are averages and estimates—hydration is an individual task. Thirst is your body's natural tool for measuring it, but it isn't perfect. Use the water intake calculator to find your optimal daily water consumption and change your routines to meet the mark. Then, enjoy the benefits of a body functioning as it should. Sawka, M. N., & Montain, S. J. (2000). Fluid and electrolyte supplementation for exercise heat stress. The American Journal of Clinical Nutrition, 72(2), 564s-572s. Campbell, S. (2004). Dietary Reference Intakes: Water, Potassium, Sodium, Chloride, and Sulfate. Clinical Nutrition Insight, 30(6), 1-hyhen. Stand, A. P. (2009). Exercise and fluid replacement. Medicine and Science in Sports and Exercise, 39(2), 377-390. Taylor, A. T. (2011). High-altitude illnesses: physiology, risk factors, prevention, and treatment. Rambam Maimonides Medical Journal, 2(1). ROBERTS, K. E. (1963). Mechanism of dehydration following alcohol ingestion. Archives of Internal Medicine, 112(2), 154-157. Gardner, J. W. (2002). Death by water intoxication. Military Medicine, 167(5), 432.